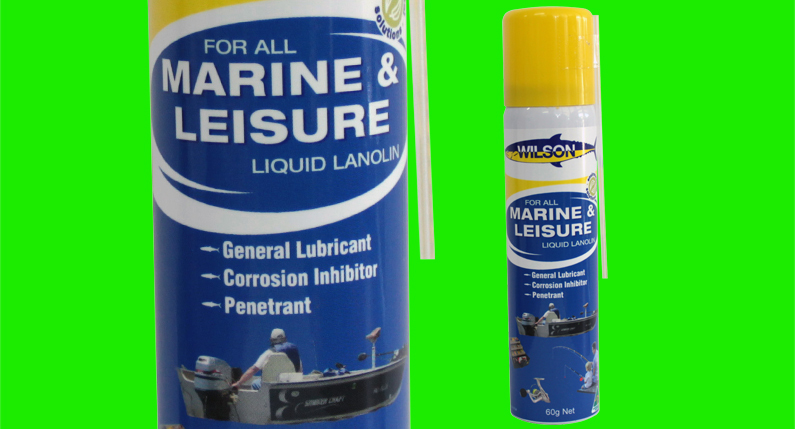 Wilson Marine and Leisure Liquid Lanolin cleans, lubricates, rejuvenates and extends the life of metals, vinyls, plastic, leather, fibreglass and powder coated surfaces. It is the ideal choice for protecting marine hardware, cabling, outboard engines and fishing gear from the harmful effects of corrosion. Lanolin is an environmentally friendly, non-conductive, salt and acid resistant product that protects, rejuvenates and lubricates many different materials. The lanolin lubricates and protects moving parts on tools, reels, zippers and chains, while being robust enough to resist high pressure cleaning. Lanolin can also be used to penetrate and free up rusted equipment, effectively working as an anti-seize agent in the field. Application is via a directional nozzle that allows the lanolin to be placed exactly where it is needed, including tight and hard-to-reach places that ordinary spray nozzles cannot reach.